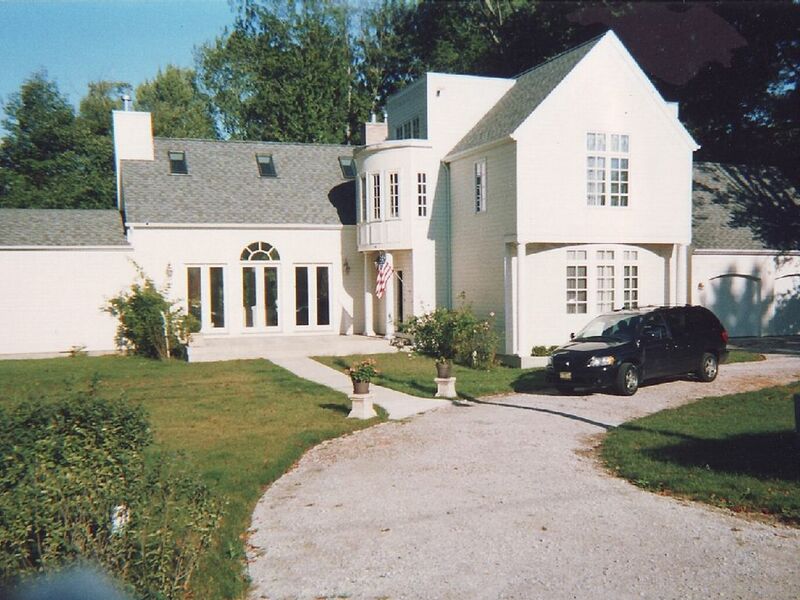 Elegant home with five fireplaces (one wood burn in den) with marble mantles and beautiful heated Gunite pool (20X40). The pool is heated and open April through mid October. Located about 1/2 hour from Notre Dame. Has a large great room and beautiful formal separate Dining Room with stone floor. French doors looking back to the pool and garden. Brand new cherry flooring and kitchen cabinets. Sits on half acre of land with back patio, privacy fence and lovely garden. Pets welcome. Wired for sound throughout with outdoor speakers. Computer and 4 TV's One bdrm on 1st floor. Two blocks to private beach. Washer/Dryer. Close to shopping restaurants. 90 min. from Chicago. Beautiful home with multiple fireplaces and pool! We rented this house for a long girls weekend and had a wonderful time! The house is beautiful, spacious and decorated with a casual sophistication. The large front room was very light and we enjoyed several cozy conversations in front of the fire. The two-sided fireplace also allows for relaxing dinners in the lovely adjoining dining room. The bedrooms were large, two with private bathrooms and three with gas fireplaces (the house has five fireplaces in all). Unfortunately, it was too cold to take advantage of the large pool in the backyard but we did take the short walk to the beach several times to enjoy the view. The house is a short drive to several surrounding restaurants, shops and antique stores so we were in heaven! All in all, a wonderful house for a get away…can’t wait to come back to enjoy the pool in summer! My friends and I enjoyed a fantastic fall getaway at this beautiful home this past weekend, it was the perfect retreat! Five fireplaces and an uber elegant design scheme make this home quite the idyllic setting! The large bright great room and attached formal dining room is the perfect place to gather with groups. The surround sound speakers are such a nice feature! I look forward to returning to this lovely home!! BEAUTIFUL home!!! THIS IS A MUST STAY!!! This home is gorgeous!! PLENTY of space and was very well- maintained. Gorgeous two way fireplace in the living room which leads into the dining room. This vacation home is just the right place, whether you are getting away for the fall/winter or enjoying the sun by the massive in ground pool in this homes backyard. The home is a close walk to the beach. The owner was very responsive and helpful. I would highly recommend this house for a getaway in Pure Michigan. I loved staying at this house! It is such a beautiful place with tons of natural light, a gorgeous yard and pool, a cozy tv room, plenty of beds and really nice, original touches. It is so close to the beach and to the shops and restaurants, but it also feels like a get away. Everything is up-to-date and the house was perfect for our weekend away! I Had a smaller house as their number had dwindled to four. On my new cleaner who does a great job. Comfortable home with awesome pool! Beautiful long fall weekend at this comfy home. Backyard trees were ablaze with color and the roar of the lake waves could be heard while sitting on the attractive back patio with pool lights adding to atmosphere each evening. Our group used three of the four bedrooms and all were attractively decorated and very clean. We loved the openness of the great room and the oversized elegant dining room. We will definitely be back next fall.